The idea for these awesome bunny and carrot homemade tortilla chips came from Ludicrous Mama over at Biting My Hand. She made bunny ones for her daughter and I thought they were so clever! So I knew I wanted to make some for little miss!! 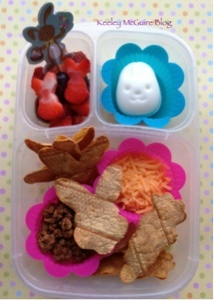 I took some gluten free mission brand corn tortilla shells and cut out bunny and carrot shapes with my cookie cutters. Sprayed with some canola oil, sprinkled with salt, and baked at 375... I got distracted making the fellas lunch while they were baking and they're a little more overdone looking then I'd hoped but I did try one to be sure and they tasted yummy! Score! In the pink silicon cups are leftover taco meat and cheese so she can spoon on her chips, which she loves. Top right is a hardboiled egg done in her bunny egg mold. Fun lunch! My little one would love this! !